With the current version of iOS, you can organize your app icons into folders on your Home screens so that you can find them more easily. The iPod touch comes with three apps already organized into a folder — the Utilities folder, which holds the Contacts, Calculator, and Voice Memos apps. 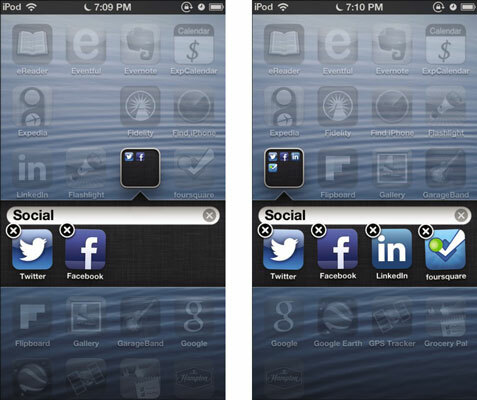 Folders also make it easier to find categories of apps — you can add all your social networking apps to a Social folder or add all your news-gathering apps to a News folder. While your icons are wiggling (which they do when you press and hold), drag the first app icon you want to include in the folder onto the second app icon you want to include. The system creates a new folder, including the two app icons, and shows the folder’s name, which is based on the first icon you dragged. For example, if you drag a social app like Facebook over another social app, such as Twitter, the folder is automatically called Social.You can then tap the folder’s name field and use the keyboard to enter a different name. To close a folder, tap outside the folder if you want to do more rearranging, or press the Home button to stop rearranging your app icons. To add another app icon to a folder, touch and hold an app icon to start the icons wiggling again (if they’re not already wiggling), and drag the app icon onto the folder. The app icons line up inside the folder. To move an app icon out of a folder, start the icons wiggling again if they’re not already, tap the folder to open it, and then drag the icon out of the folder. To delete a folder, move all the icons out of it. The folder is deleted automatically when empty. You can put up to 12 app icons into a folder. Like individual icons, folders can be rearranged by dragging them around the Home screens. You can also drag folders to the dock.